All it took was one flash of Mexican singer Luis Miguel's toothy grin to send thousands of his fans into complete hysteria. Hearts raced and knees buckled once México's beloved sol uttered the first musical note at the Save Mart Center last Tuesday. Fans of all ages cried, shouted their admiration, sang along with their beloved Miguel during the opening tour date of his 'México En La Piel' tour. The tour will take him throughout the U.S., México and Latin América. 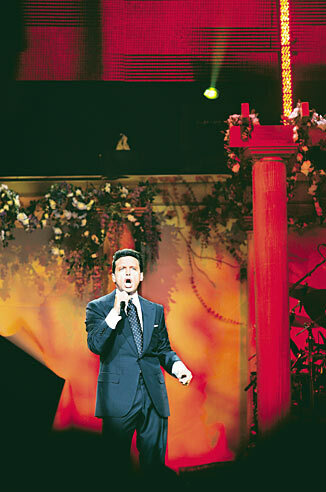 "Luis Miguel is like no other. His voice and music have a way of making me happy when I'm sad. He has everything to make him one of the best singers out there," Yemina Miranda, 38, said. "I didn't bring anyone with me to the concert because I always keep my focus on him. I don't want anyone distracting me from my Luis." Miguel, 35, sang hits from his extensive music career that spans more than 20 years. He sang his effervescent pop songs and his elegant, debonair love ballads. Besides delighting the crowd with his suave vocals and seductive charisma, Miguel awed his fans with four wardrobe changes including a charro suit. He even did his infamous kick, which made everyone shriek with excitement. "Oh my goodness I love that patada he does. I've been waiting and waiting to see him come to Fresno. I wasn't disappointed. He exceeded my expectations of what a true Luis Miguel concert would be," said Aida Jaímez, 43. "I hope he comes back here again because I'll be ready." Norma Verduzco couldn't agree more with Jaímez. "He was fantastic," said Verduzco. "Luis Miguel is the epitome of elegance." Luis Miguel was a teen idol in the early '80s and acted in movies like 'Fiebre de Amor' (The Fever Of Love) and 'Ya y Nunca Más' (Enough, And Never Again). In 1991, he unveiled a much more refined and mature Miguel when he co-produced his album 'Romance,' the first of what would become a trilogy that earned him 70 platinum albums world wide. 'Segundo Romance' gave him one of his three Grammys. In 2000, he won two Grammys for 'Male Pop Vocal Performance' and 'Best Pop Album' for his album 'Amarte Es Un Placer'(Loving You is a Pleasure) at the first annual Latin Grammy Awards. Throughout the concert Miguel spoke and greeted his fans. An occasional fan or two got to rub palms with the Mexican music idol. For Hilda Rodríguez, 45, from Firebaugh, there's no one like Miguel and she knew he wouldn't let her down. "He sings with a lot of emotion and sentiment. There's no other singer that can do it like he does it," said Rodríguez. "Seeing him live just proved my thoughts exactly. There's no one else like our Luis Miguel."